The Boeing P-8 Poseidon (formerly the Multimission Maritime Aircraft or MMA) is a military aircraft developed for the United States Navy (USN). The aircraft has been developed by Boeing Defense, Space & Security, modified from the 737-800ERX. The P-8 conducts anti-submarine warfare (ASW), anti-surface warfare (ASUW), and shipping interdiction, along with an electronic signals intelligence (ELINT) role. This involves carrying torpedoes, depth charges, SLAM-ER missiles, Harpoon anti-ship missiles, and other weapons. It is able to drop and monitor sonobuoys. It is designed to operate in conjunction with the Northrop Grumman MQ-4C Triton Broad Area Maritime Surveillance unmanned aerial vehicle. The aircraft has been ordered by the Indian Navy as the P-8I Neptune, with at least one already delivered, and the Royal Australian Air Force. The Royal Air Force also intends to order the P-8. I am sure that Hasegawa was thrilled to learn that the P-8 was being developed. After all, they have had a 737-800 kit on the market for quite some time and now they get a whole new line of kits for just the cost of a single new sprue! So it turned out to be. The 737-800 is one of their relatively newer line of kits. It includes a fuselage bare of windows, a hefty nose weight, the standard Hasegawa 1/200 display stand, a set of 'wheels up' bits that simply plug into place and the older style engines. By this I mean that the engines are not the single mold that the newest kits offer. The newest kits also have horizontally split fuselages and this one is the 'standard' vertical split. OK, so what is new? Well, that is the K sprue. You see, the P-8 has a ton of lumps and bumps sticking out of the fuselage in all sorts of places. Frankly, I do not recall any but the SPOD P-3s sporting protuberances such as what the P-8 carries. For those fearing a need to break out a tape measure to figure out where all these pieces go, fear not. 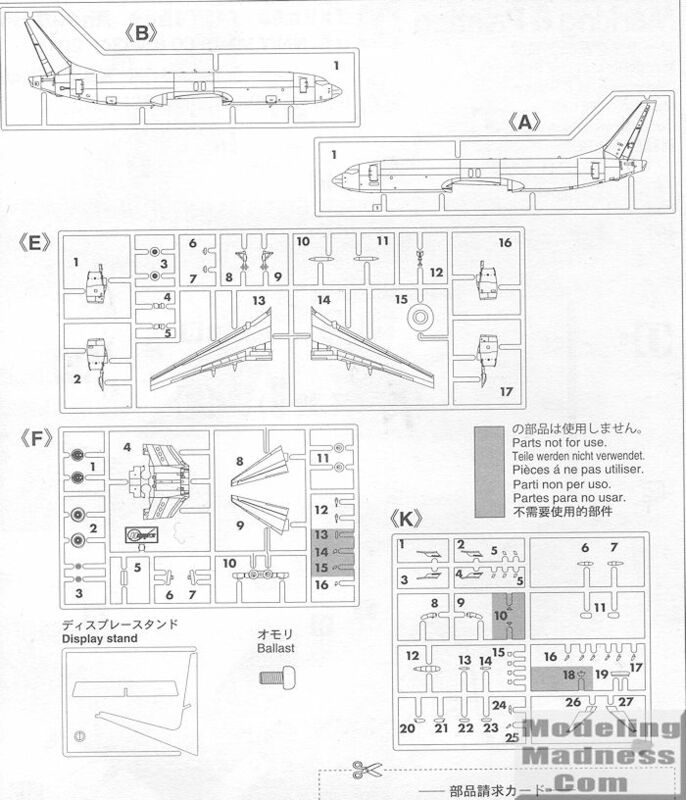 Hasegawa has modified the fuselage mold to include little areas where the holes are flashed over so all you have to do is follow instructions and open up what is needed. Of course, you'll also have to fill in some unnecessary side doors, cargo bay doors and panel lines, but you are shown just what is needed. An interesting feature of the P-8 compared to airliners is that the winglets are actually somewhat downturned. Looks odd, but there it is. 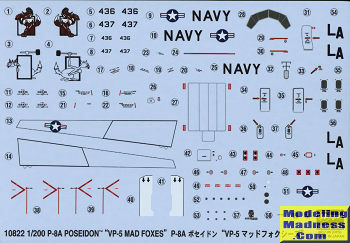 Instructions are standard Hasegawa stuff with Gunze paint references but basically you are looking at overal FS 16440, light gull grey, a pretty standard color that any USN modeler will have aplenty. Leading edges of flight surfaces and engines are silver. Markings are for two planes from VP-5. The difference is in the nose number and in the tail markings. Unfortunately, like most VP tail markngs, they are in black and greys, but better than nothing. If one recalls, it was following the 1986 Libyan conflict where all the really big markings were removed for fear of retaliation (something that, as usual, never happened). Somewhere I have a photo of VP-46 removing the markings back then. There are currently (October 2017) eight operational squadrons flying some 50 or so P-8As, along with one training squadron and two test units in Pax River. This will certainly keep Hasegawa in limited edition boxings for several years to come, especially as the P-3C is slowly phased out. It is nice that Hasegawa has chosen this scale for the kit as even 1/144 would make for a fairly large model when it is finished. This particular boxing was released about a week back so it is pretty new and should reach US hobby shops rather soon.